Generally, we recommend our print photo enlargements to be a minimum of 150 PPI (Pixels Per Inch, This is the number of pixels per inch in your image). But, we can print an image that is as low 100 PPI. Viewing distance has lot to do with 'acceptable quality". If your photograph is to be viewed close up, say within 5 feet, we recommend that you stick with 150 PPI. If being viewed at 5 feet or greater, 100 PPI may be acceptable. We can of course print photo enlargements that have a higher PPI. You may see a slight improvement when enlargements are viewed close up, say within 3 feet. Generally, images over 300 PPI will have no additional gain in quality. DPI, Dots Per Inch, is a printer term. Every pixel in your image is made up of different inks from the printer. Our Epson's use 7 inks. The printer needs to convert these colors to that of which the printer uses. So, each pixel in your image is printed to a bunch of smaller dots, or sub-pixels. Usually the more dots per inch, the better the color and blend between tones. While printing at too low a DPI can cause inferior quality in colors and tones, too high a DPI can cause excessive costs without appreciable gain. We print at 1400 DPI on glossy and other coated papers, while usually 720 DPI for uncoated papers. Sometimes we will print at 1400 DPI on uncoated papers with certain images. Images that are smaller will show "pixelation" and or a loss of detail, depending on how much smaller your file is to our recommendations. Things to keep in mind are how much fine detail is in the photo, average viewing distance and lighting conditions. 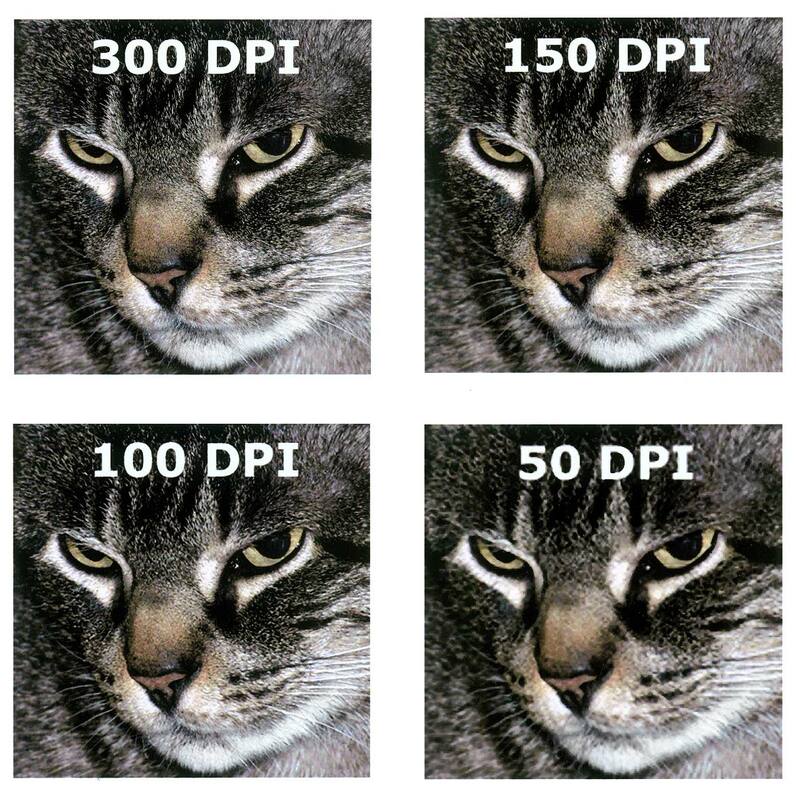 In our test, we saw the slightest of slightest increase in definition from 150 to 300 DPI, but, we saw a reasonable drop of quality at the 100 DPI resolution. It may be difficult to see here as your monitor is under 100 DPI and we shrunk it down to fit. Viewing at full-size will show the results better. A clear loss of quality was seen at 50 DPI and for the most part, is considered unacceptable. The photos above are at about original size and represent fairly well the visual quality at normal viewing distance. To view this photo at twice the size, please click here. You'll see the detail better but remember, it would be like viewing the photo at very close distance or under a magnifier.